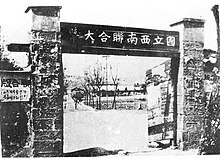 When the Second Sino-Japanese War broke out between China and Japan in 1937, Peking University, Tsinghua University and Nankai University merged to form Changsha Temporary University in Changsha and later National Southwestern Associated University (Lianda) (traditional Chinese: 國立西南聯合大學; simplified Chinese: 国立西南联合大学; pinyin: Guólì Xīnán Liánhé Dàxué) in Kunming and Mengzi, in Southwest China's Yunnan Province. After the war, the universities moved back and resumed their operation. What was left behind in Kunming became the National Kunming Normal University which later emerged as the Yunnan Normal University. Commemorative stone of the NSA university. By summer 1937, the Imperial Japanese Army had bombed Nankai University to the ground in Tianjin and occupied areas including the campuses of two of the country's leading universities in Beijing: Peking University and Tsinghua University. These three universities, which were some of the country's most prestigious, modern institutions of higher learning and research, with the agreement of those who led the institutions — men of high standing who had been educated abroad — retreated to Changsha, the capital city of Hunan province (about 900 miles away from Beijing) to unite. By the middle of December 1937, many students had to leave to fight the Japanese when the city of Nanjing fell to enemy forces. As the Japanese forces were gaining more territory, they bombed Changsha in February 1938. The 800 staff faculty and students who were left had to flee and made the 1,000 mile journey to Kunming, capital of Yunnan province in China's remote and mountainous southwest. It was here that the National Southwest Associated University (commonly known as 'Lianda') was formed. In these extraordinary wartime circumstances for eight years, staff, professors and students had to survive and operate in makeshift quarters that were subjected to sporadic bombing campaigns by the Imperial Japanese forces. There were dire shortages of food, equipment, books, clothing and other essential needs, but they managed to conduct the running of a modern university. Over those years of war (1937-1945), Lianda became famous nationwide for having and producing many, if not most, of China's most prominent academics, scholars, scientists and intellectuals. When the war ended with victory over the Japanese, the Lianda community, which had entered the war fiercely loyal to the government of Chiang Kai-shek, emerged in 1946 as a bastion of criticism of China’s ruling Kuomintang party. Within three years, the majority of the Lianda community had returned to their north China campuses in Beijing and Tianjin, and was prepared to accept Communist rule. In addition to struggling for physical survival, Lianda’s faculty and students spent the war years striving to uphold a model of higher education in which modern universities, based in large part on the American model, sought to preserve liberal education, political autonomy, and academic freedom. By 1952, the Lianda ideal had been largely replaced with a politicized and technocratic model borrowed from the Soviet Union. John Israel. Lianda: A Chinese University in War and Revolution (1999) Stanford University Press. ISBN 0-8047-2929-8.